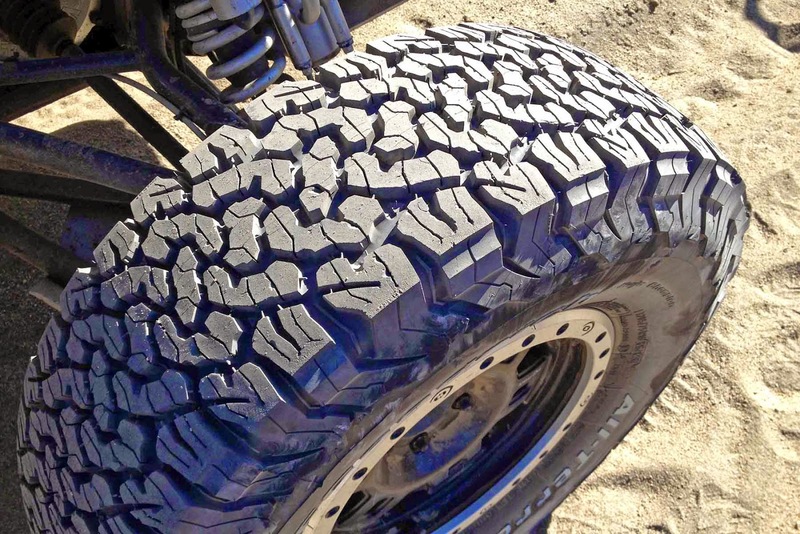 Whenever someone asks 4wdNewz about the best all terrain tyre, the answer usually comes back in a flash, "you can't go wrong with the BFG All Terrain KO." But that's faulty advice according to the latest issue of Driving Out, which lays claim to being the number one South African off road magazine. It has published the results of a test of 15 all terrains and the BFG came … dead last, half a dozen points behind the Nankang Rollnex FT-7, whatever that is. Winner of the Driving Out test, by a clear margin, was the General Grabber AT2, followed by the Bridgestone Dueler D694, the Hankook Dynapro ATM and the Goodyear Wrangler AT/SA+. Also in the top 10, in descending order, were the Kumho Road Venture SAT, Toyo Open Country AT, Continental ContiCrossContact AT, Falken WildPeak A/T02 and the Achilles Desert Hawk AT. Other magazines with good testing methodology have almost always placed the BFG all terrains top or in the top three and 4wdNewz's own experiences and observations have shown it as convincingly competent. Driving Out also seems to have used good methodology and had former Dakar winner Ginel De Villiers to conduct the tests, which concentrated on stopping distances on sealed and loose surfaces and off road performance in loose and sandy conditions. Indeed, the BFG was criticised for having too aggressive a tread pattern for loose sand and dirt. South Africans like to regard themselves as the world's greatest off roaders – at least that's the impression you get talking to immigrants who have joined a club or go on tag-along trips – but in this case it seems that what shines in the Glorious Republic doesn't export to all nations. We'll stick with liking the BFGs and their overly aggressive treads, thanks. Note: There have been some useful comments about all terrains; check them out, below. I can attest to the effectiveness of the Bridgestones. Although I have the Mud Duelers, the Duelers apparently are almost as good in the mud. They are also very good on-road and in the wet and very little road noise. Thanks for sharing that link; it's a great article that should interest anyone thinking of buying a set of all terrains. I run a set of BFG KO2s and am very impressed. They'll run with the mud treads in many track conditions. And maybe I'm missing something, but they seem fine on sand, too. You called it right on the S Africans, mate. We have some at the club and they think they're gods gift to 4wding. In order to avoid a stern letter from the race relations conciliator, let's now leave alone commenting on perceived attitudes of our valued citizens and immigrants from other nations. I've had BFG All Terrains, Coopers and General Grabbers on my 90 at one point or other and found it hard to say one was better than the others, although the Generals wore quicker. The Coopers were probably a bit quieter on road, but with a Land Rover that hardly mattered. Coopers. Don't even look at anything else for NZ, partic. the SI.